What secrets are lurking in the shadows of King Ludwig's castle? Dozens of hidden swans are scattered throughout thirty new rooms in Castles of Mad King Ludwig: Secrets. Ludwig is particularly fond of these swans, which provide both much-needed cash at any time or can be collected for big bonuses at the end of the game. Surrounding and protecting your castle are new moats, making every room inside it even more valuable. The King has come up with more favors, including one for creating courtyards. Finally, secret passages enhance connections and muffle sound from activity rooms. 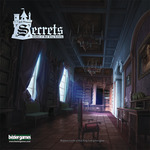 Castles of Mad King Ludwig: Secrets is an expansion for Castles of Mad King Ludwig that will help you build even more amazing, crazy castles than ever before!